Once a British colonial post, Victoria is full of historic sites, public parks and groomed gardens. From beaches to mountains, her exquisite parks to enchanting architectural sites, Victoria has it all. 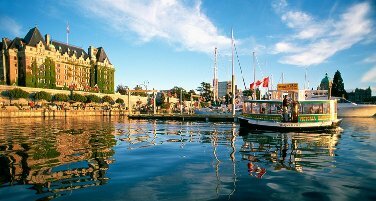 Due to its location, this quaint yet sophisticated little seaside city boasts the mildest climate in Canada. Butchart Gardens - Visitors from all around the world are drawn to these 55 acres of spectacular floral displays which really do captivate. There are thousands of varieties of flowers, trees, shrubs and exotics, with four main gardens and seasonal attractions. Craigdarroch Castle - This towering Victorian mansion is a National Historic Site, complete with a tower and turrets and is a local landmark. The fortune of the Dunsmuir Family is reflected in the Castle's 39 rooms and 5 floors of stained glass windows, intricate woodwork and lavish Victorian era furnishings representing late 19th century lifestyles of the very rich and the beautiful garden nearby is also impressive.